A North American river otter. Yellowstone National Park, in northern Wyoming, is home to some of the most spectacular natural wonders of the world. Studded with bubbling mud pots, steaming hot springs, and roaring geysers, the park is visited by more than 4 million people every year. It’s also a haven for wildlife like coyotes, elk, bears, bison, and foxes. But a certain creature provides the most entertainment value, whether it’s sliding down snowbanks on its belly or ice fishing. It’s the river otter (Lutra canadensis), star of the NATURE program Yellowstone Otters. A relative of the better-known sea otter, this exuberant mammal is also a relative of the weasel and shares that animal’s thick fur, which insulates it against Yellowstone’s icy winter. As they race gleefully down snowbanks or ride waterfalls into deep pools of water, river otters may look as if they don’t have a care in the world.But otters actually spend their days constantly on the move. A resting otter is more likely to have a run-in with a predator, like a hungry eagle wheeling overhead, or competition, in the form of a coyote trying to steal an otter’s newly caught trout. But as long as an otter is within sliding distance of the water, it’s safe. In Yellowstone’s frigid rivers, at least, the otter is at the top of the food chain. Yellowstone may be locked in wintry conditions for eight months of the year, but its animals have a secret weapon for surviving the cold. The park is full of thermal pools, caused by the area’s proximity to the molten rock underneath the surface of the earth. The same superheated puddles that cause geysers to shoot into the air keep Yellowstone’s lakes and rivers from freezing over. 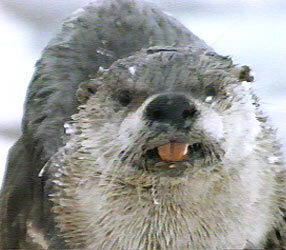 So, otters have access to fish, the staple of their diet, throughout the winter. Thirteen Online is a production of Thirteen/WNET New York's Kravis Multimedia Education Center in New York City. Ann Willmott Andersson, Director of Interactive & Broadband.